Stay provides a basic interface for editing stored windows. Select “Edit Stored Windows…” from Stay’s menu to open a window containing a list of display configurations for which windows have been stored. This window is shown below. The current display configuration is displayed in bold. 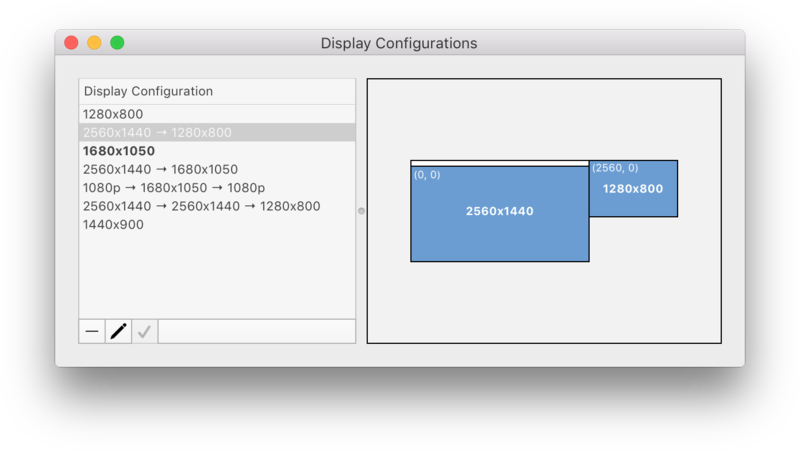 “1680x1050” is the current display configuration in the screenshot above. A graphical representation of the display configuration is displayed to the right of the list. The screen with the white bar across its top edge is the “main” screen. The numbers in the centre of each screen are the screen’s width and height. The numbers in the top-left corner of each screen are the co-ordinates of the screen’s top-left corner, relative to the main screen. Occasionally macOS will forget a display’s previous configuration. If this happens, Stay will be unable to restore windows for the display, because the correct display configuration is not be active. To make the correct display configuration active, simply click on its name, then click the tick/check mark button. Note that a display configuration can only be made active if its displays are already connected to the computer. If this is not the case the make active button will be disabled. To label a display configuration, simply double click on its name. By default display configurations are labelled according to the number of connected displays (e.g. “2 Displays”), but it can be helpful to give them more descriptive labels. To remove a display configuration and all of its stored windows, click its name, then click the minus button. To edit the windows stored for a display configuration, click its name, then click the edit button (pencil icon). The stored window editor will be displayed, as shown below. To label a stored window, simply double click on its “Descriptive Label” column. By default windows are labelled with their title, but it can be helpful to give them descriptive labels. As an example, Finder windows can be given descriptive labels such as “Home Folder” or “Applications Folder”. Labelling stored windows can be useful when linking windows, as it can be difficult to differentiate windows based solely on their default labels and screenshots. To remove a stored window, click its name, then click the minus button below the “Windows” table. To remove all of an application’s stored windows at once, click the application’s name, then click the minus button below the “Applications” table. Setting a pattern match string for a stored window forces Stay to restore any window with a title that matches the pattern to the size and position of the stored window. This can be useful when an application has a number of similar windows that vary only by their title (e.g. Terminal, Safari), or with applications that tend to require a lot of window linking (iTunes, Chrome). 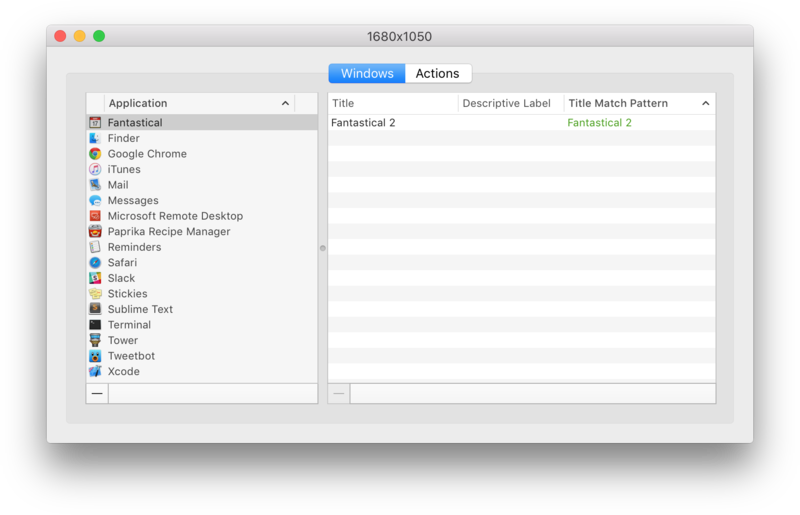 For more detailed information on window title pattern matching, refer to the Window Title Pattern Matching section.